It’s a picture that tells stories. Wonderful. 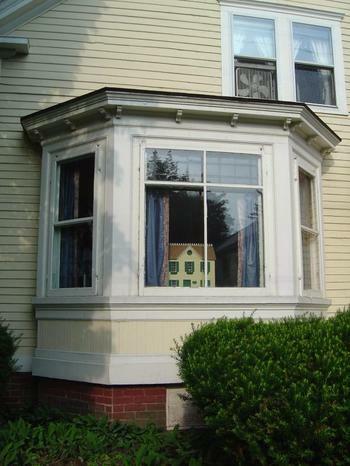 When you first noticed that house peering out the window at you, did you feel watched? That’s great, Lorianne! And it feels like one of those Russian dolls – maybe there is another house inside that one, inside that one…the thing is, a lot of dollhouses ARE about finding a different kind of home, aren’t they? Or about escaping the one we actually live in for a make-believe, controllable world in miniature. I’ve always loved dollhouses…and yes, Beth, I hope there *is* another dollhouse within this one. Dave, when I first saw this house, I didn’t feel like I was being watched…but I did feel a sudden surge of loneliness. To my eye, that little house looks *sad*, like it’s looking out the window, wanting to be outside. Maybe its the way it’s hiding behind the curtain, like a shy, uncertain thing. Funny how easy it is to personify house facades, isn’t it? So my gut response is in line with one Leslee mentioned: a house wanting escape. Maybe it’s a Doll’s House straight out of Ibsen: something simultaneously quaint & proper, but also controlling & confining. as true as any word called home coule be, Lorraine. What a wonderful photo. Melancholy and sweet and contemplative, all in one. Yes it’s a house full of stories and a beautiful photo, Lori. I wonder if the doll’s house was put in the window so that passers by could make up tales about that juxtaposition of big house, little house and maybe others within that. Yes, that house-within-a-house looks like it’s been “unmanned,” doesn’t it? And what a perceptive comment by Patry Francis (and what a wonderful adjective “sylvan” is).